In the hardest time of my life, when I almost died, my spirituality saved me. I lived on the streets of New Delhi, India, trying to survive alone starting when I was only four years old. I remember seeing a lot of other people who were homeless, adults shouting at their kids, and huge stacked-up piles of garbage. The cows were also in the garbage looking for food. I was looking for survival. It was an instinct, the only way I could continue. I remember that everything tasted rotten. Food lost its deliciousness. It was like after someone ate something delicious, they threw away the corpse of their food to wither away. That’s what I was eating. A lot of people that I saw worshiped the ground they stood on. They took the sand from their homes when they left and put it on their foreheads. I tried to learn from them. I put the sand I found on the streets on my forehead. When I was six I got captured by the police and sent to an orphanage, the Welfare Home for Children. I was first taken to the basement. There was a lady down there who made a report about me. The basement was really dark except for the light of her room, and that was really dim. After that, a woman came to get me, who ended up being always with me. She was part of a group of women who took care of us. We called them our Aunties. During that time I became someone who didn’t see hope or light in my life anymore. My spirit was always strong though, and nothing could extinguish it. I would hear the auntie/caretaker tell tales about gods and goddesses in Hinduism. She regaled us with stories about how God Vishnu, the preserver and protector of the universe, created the other two worlds as represented by Shiva the destroyer, and Brahma the creator of the universe. Brahma was the god with three heads who sat on a lotus. Shiva had a snake around his neck and would stay on the snowy mountains with his goddess, Parvati, and his son, Ganesha. I was so in love with all the tales that were told of Hinduism. We were taught to believe in reincarnation, which means when we die we would be reborn on this earth as someone new, forgetting our old selves. But a glimpse of our old selves will show in our new selves. When I heard those tales and felt so proud of my culture, my spirit blazed bigger and farther inside me. A glimmer of hope came back. There would be special holidays to worship the gods and goddess such as Holi, the festival of colors, and Diwali, the festival of lights. Diwali is still my favorite holiday because the houses and streets would be would be lit like a Christmas tree. There would also be presents and fireworks! Even though I lived in an orphanage some of us were chosen to participate in the festivities. They would pick names randomly out of a box. But first, they took out the names of the kids who were doing badly at the orphanage, either doing bad things or not doing well in school. If you did bad, you could not be chosen to leave and celebrate the holiday. I got chosen once and I loved it. A lot of kids kept telling me the trip was an opportunity to run away and leave the orphanage. But I didn’t try because I had a hard life on the streets and I could have easily gotten an illness on the street. At least here I had a shelter, a place to live for the time being, a place where I was cared for so I could carry on. I was choosing between horrible and the brink of horrible. Time after time I would get recurring visions of gods and goddesses inspiring me to be a good person and put everything into whatever I’ve committed to. God Vishnu also gives me the knowledge to see gods or goddesses in every person. Hinduism has a special greeting called “namaste,” which means “the divine in me bows to the divine in you.” All the holidays for the gods and goddesses make me proud and devoted to my culture and religion. One lesson I learned from Hinduism is this: When anyone you love dies and you pray to your gods to not let them leave this world, don’t blame them if your loved ones go away. Just remember, even though they left their bodies, their spirits will always be lingering around you. They will watch over you from wherever they are. They will be born again to meet up with you in their next life, for you will never be separated from them. 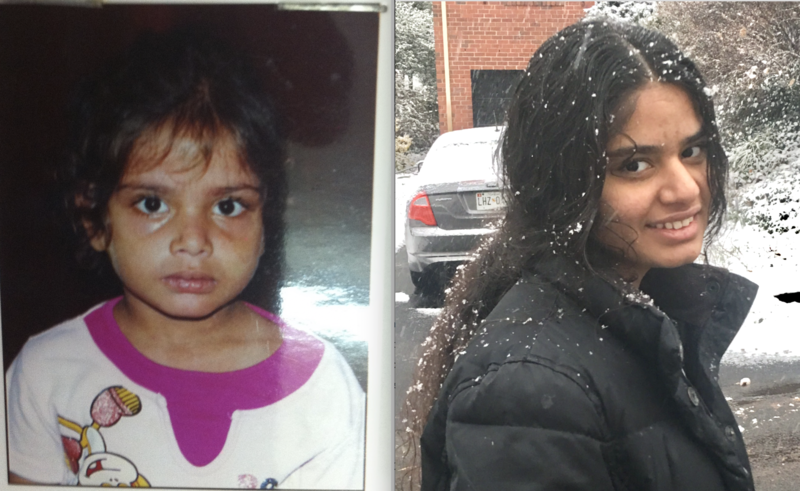 After two years I was taken from the orphanage to a new home in America. I am now becoming someone who believes in the very essence of life. Because of this experience, I became devoted to my culture and life. Ruchi is a student in the Washington, DC, area. This essay began as a class assignment on Identity. Ruchi wants to become a veterinarian. She loves all kinds of animals, especially horses, wolves, cats, and dogs. This year she plans to visit India with her American family. Beautiful story about hope and how the stories you learned from Hinduism got you through. Good luck to you in the future.